We’re hot on the trail of every NFL Training Camp as we progress into the first few weeks of the preseason. With injury news coming out every day unsettlingly, we’re tracking all the major takeaways from every team’s camp, be it good or bad, and what that could mean for each franchise heading into the season. Keeping things going today, we examine all 32 teams’ training camps to date, continuing things with the AFC East. According to Joe Buscaglia of ABC7, it was a sack frenzy during Day 6 of the Bills training camp. By Buscaglia’s count, the defense racked up a whopping 11 sacks on the 72 dropbacks that were shared between the first, second and third units. It may only be Week 1 of training camp, but it’s still a bad look for the team’s offensive line, who simply need players to step up in the wake of losing their top three starters (LT Cordy Glenn, LG Richie Incognito, C Eric Wood) from last year. 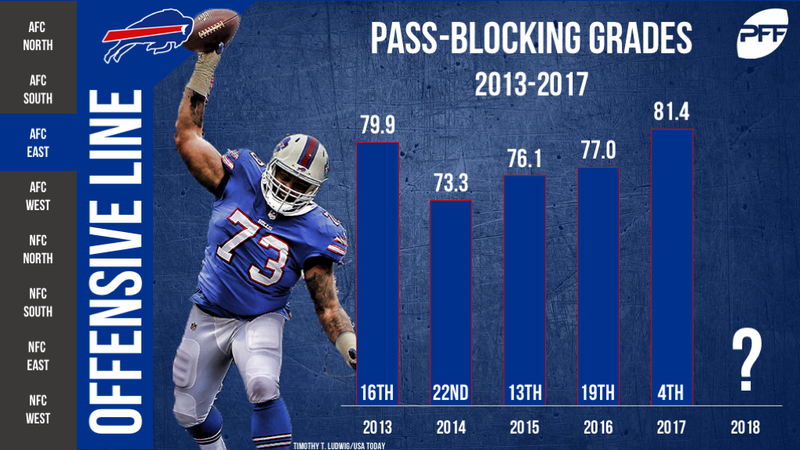 Earlier this offseason, we ranked the Bills 29th among the league’s 32 offensive lines, which looks pretty accurate if the Bills’ initial performance is anything to go on. Per Barry Jackson of the Miami Herald, rookie tight end Mike Gesicki has impressed as a receiver and has come down with several big-time catches during team drills. Gesicki was the second-highest tight end on our big board heading into the draft after he ended his final college season with a receiving grade of 84.4, the 15th-highest mark in the nation. During his final college season, Gesicki excelled in contested-catch situations and came down with 75 percent of his contested targets, which was the best mark among tight ends. If he can continue to develop as a blocker, he may well just find himself atop of the Dolphins depth chart. Wide receiver Jordan Matthews, who suffered a “significant” hamstring injury during the team’s fourth practise of training camp, has been placed on injured reserve. With the Patriots due to enter the season without three of their top performers from a season ago (Brandin Cooks, Danny Amendola and Julian Edelman), Matthews had a very real shot to contribute, but now the team will likely have to look elsewhere. This could come in the form of Phillip Dorsett, who has been spending time in the slot during training camp. 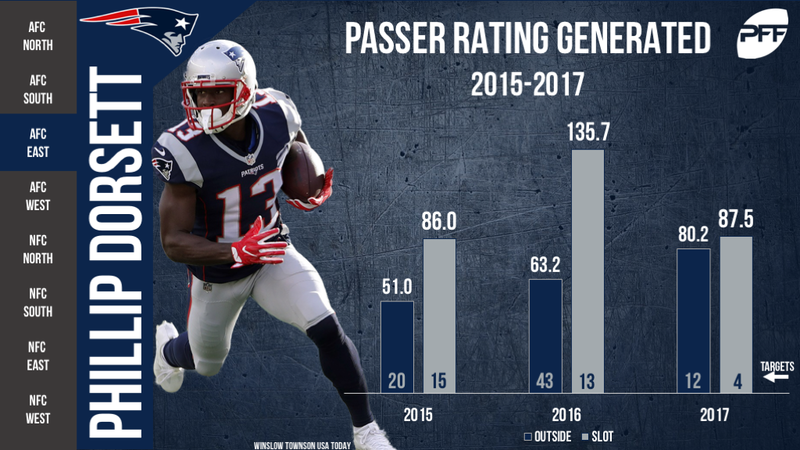 Over the course of his career, Dorsett has seen the majority of targets on the outside, but he has performed well when given the chance in the slot. In every year of his career, Dorsett has generated a higher WR Rating and averaged more yards per reception on his slot targets than his targets that came on the perimeter. Sophomore running back Elijah McGuire underwent surgery Monday to repair his broken foot he sustained in training camp, per ESPN’s Rich Cimini. McGuire showed flashes as a rookie, especially as a receiver, where he ended the year with a receiving grade of 75.4, the highest mark among Jets running backs. With McGuire set to miss about three to six weeks, this could open the door for free-agent signing Thomas Rawls, who has also shown flashes in the past and notably graded above 75.0 in two of his three years in the league.